So, first off, there is no obligation to personalize a scroll if you don’t want to. A good period style scroll done the best you can should always be welcome by anyone getting one. (After all, these are all volunteer efforts.) But if you do want to personalize a scroll, it’s a fun thing to do. If the award recipient is a friend of yours, you may know her favorite colors and favorite flowers, the time and place of her persona and the time she made cabbage soup for a banquet and all these things may end up on the scroll. If you don’t know the person well or at all, you can check on the Caid Wiki page for information about them: http://wiki.caid-commons.org/index.php/Main_Page If they don’t have much of a page, you can ask the Kingdom email list or the Kingdom Facebook page if anyone knows them. Or try to track them down in person or via email and ask what they would like on their scroll. Lucky for me, Alexander K is very well-known and turns out to have his own Facebook fan page. 🙂 Through that, I found out that a Saga had been written about him commemorating an epic battle he had with the very god Zeus. You’ll note a little arrow to the left of the capital letter. That’s a note to me to move the letter up when I transfer it to the good paper, as I want to be able to start the text next to the capital but not so low down on the page. 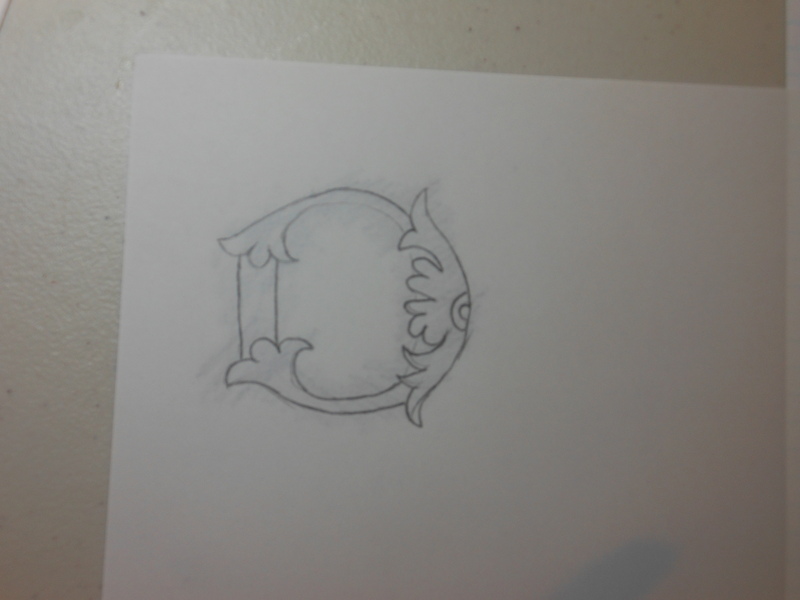 I transferred the capital letter by tracing it on to some tracing paper, then covering the back with pencil, flipping it over and tracing it back. 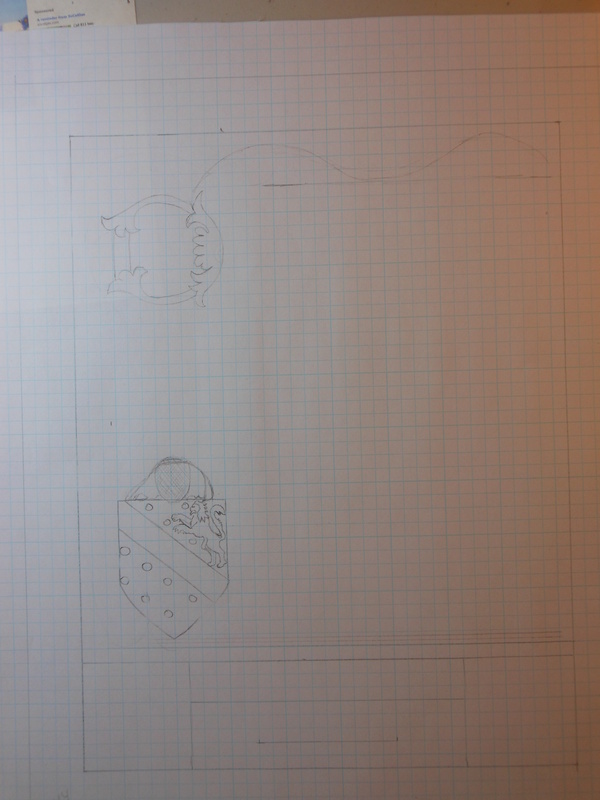 That left a faint image on my graph paper, which I copied again, changing the shape of the letter just slightly. 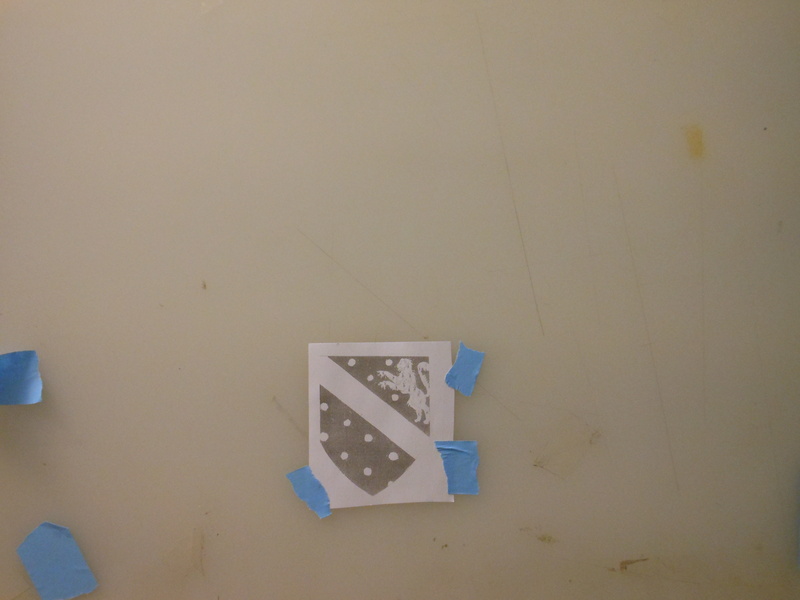 The emblazon I transferred to my graph paper layout using a light box. 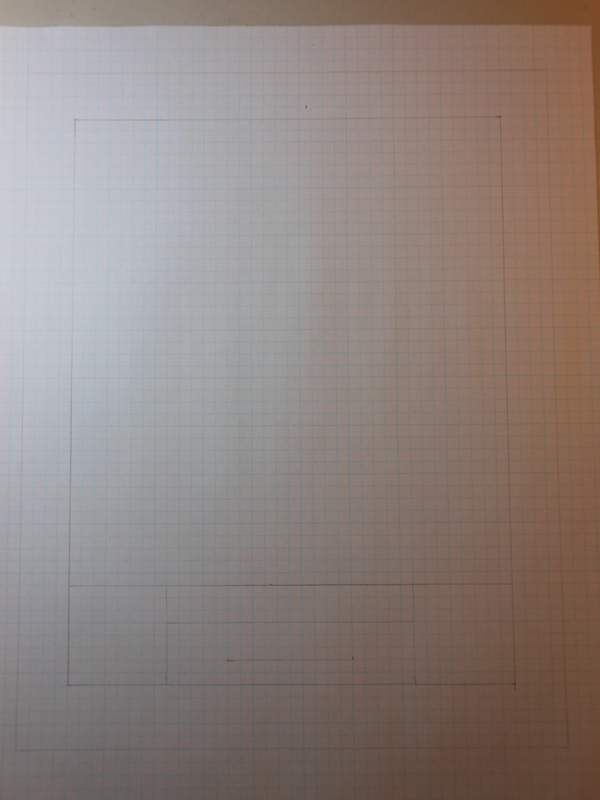 It was easier to get the spacing for the letter using graph paper. And then easier to use the light box to transfer the arms. 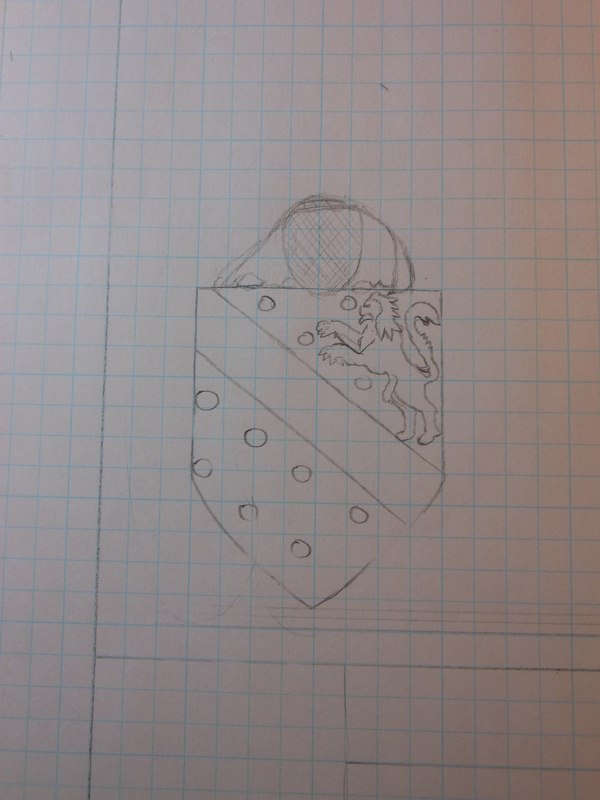 Then I free-handed a fencing helm and mantling above the shield, based on a drawing I found online. 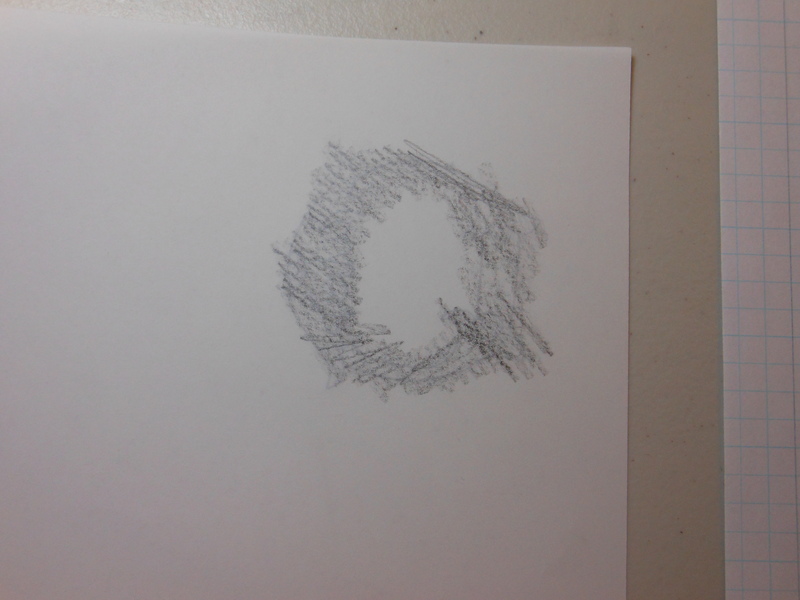 I had sketched in a squiggly line from the helm to the letter, but looking back at my examples, it didn’t really fit (and the squiggly line across the top is probably going to be changed. 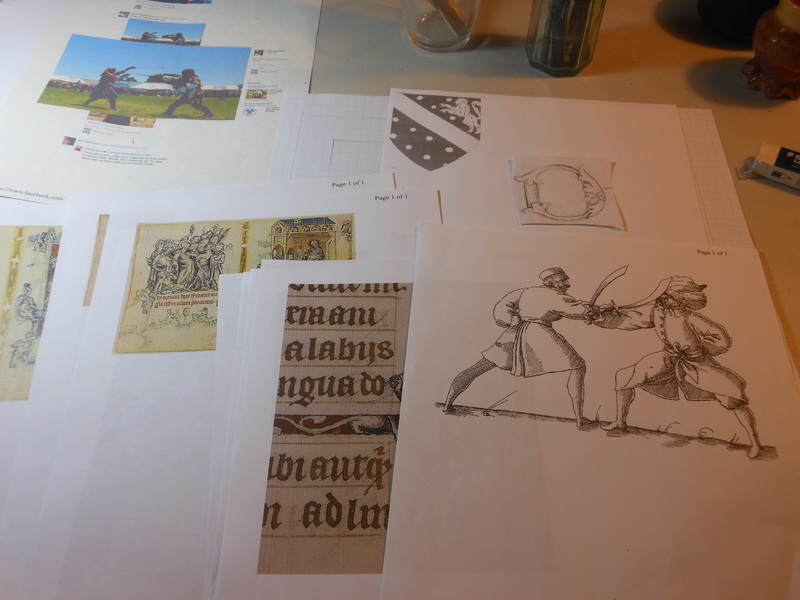 I made smaller versions of the arms, capital letter and Turkish fighters with my printer/copier (best investment ever for a scribe: Having a printer that will enlarge and reduce copies of things.) I could do the same thing scanning pieces and enlarging them with Photoshop, or enlarging them by hand, but this is a big time saver. 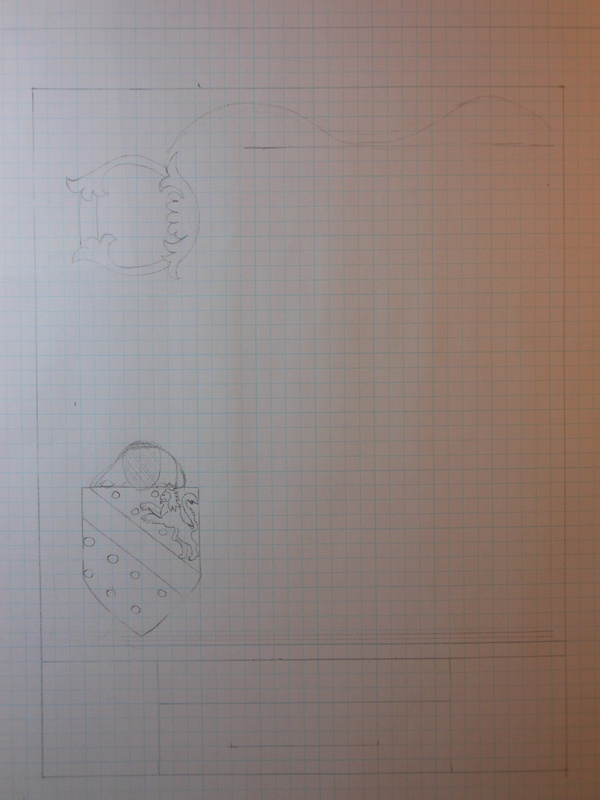 Once I got these elements on the graph paper, I realized they needed to be a bit smaller. Because I’d never done anything in grisaille before, I did a couple of test pieces. 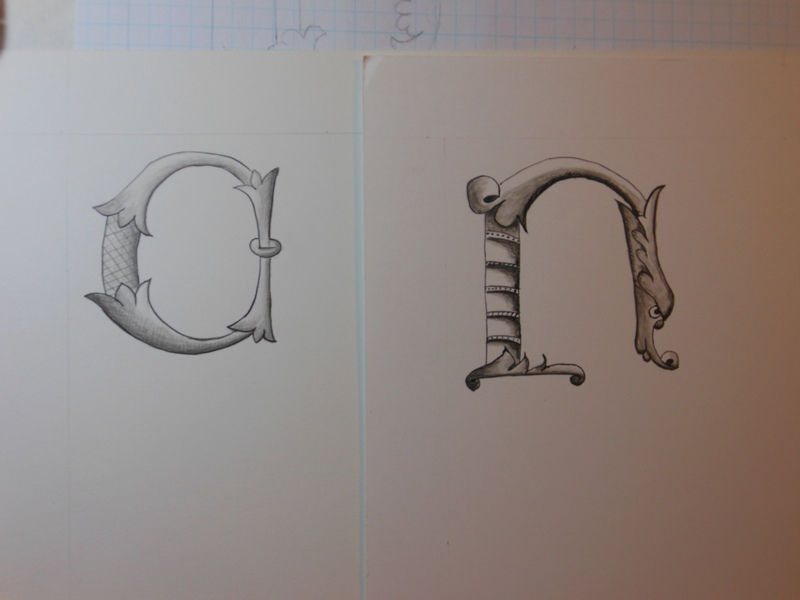 I did them as capital letters so I turn them into scrolls later. Grisaille is fascinating and I want to explore the technique a lot more. It’s all done with ink which is diluted to get the lightest colors. It’s pretty painstaking and I found I needed to really know what I wanted the end look to be before I started. There is no turning back. 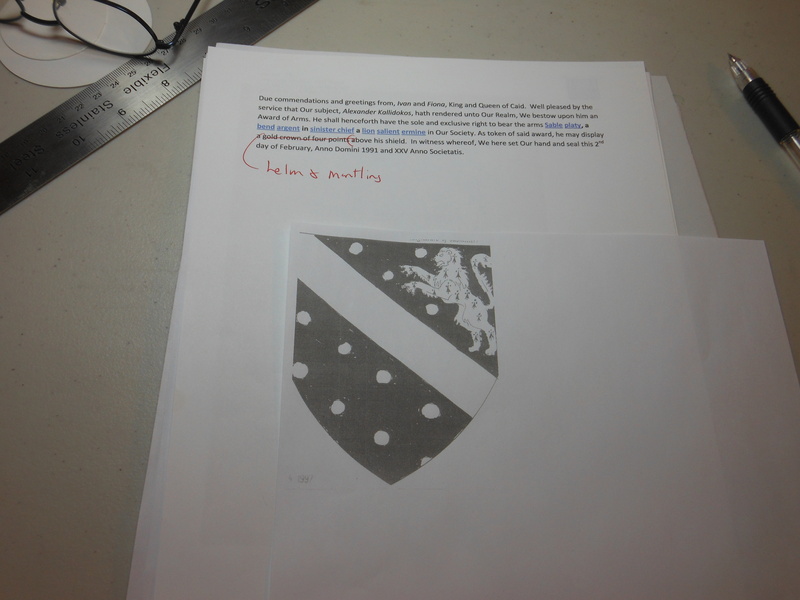 Because it’s important to make sure the name and blazon are correct, after I emailed Master Cormac for a copy of Alexander’s arms, I went to the SCA Ordinary and Armorial to double-check the registered spelling of his name to get the blazon of his arms. This the is link I use: http://oanda.sca.org/oanda_np.cgi It can be a little tricky to use. If you ever need help with it, let me know. It’s vital to make sure you have the proper spelling and blazon for all awards. I cut and pasted the information from the O&A into a word document. I also went to the Caid Scribes page and got the standard text for an Award of Arms here: http://scribes.sca-caid.org/texts.php and added that to my word doc. Then I went off to the OP to check the date of the award and to my list of King and Queen’s to get that information, which I also added to my word document. When you ask for an assignment, Dame Richenda will probably give you the date and Royalty when she gives you the assignment information, but you should double-check. If there is a discrepancy, get it figured out before you start. Going back to my word document with the correct spelling of Alexander’s name, the blazon of his arms, the date of the award and King and Queen plus the standard scroll text, I put it all together. Then I decided I wanted a different opening phrase so I changed that. I played with the text a little bit and right now I’m okay with it. When I start practicing the calligraphy I may change my mind. Currently the scroll text on the Caid Scribes website does not have the new wording for the achievement of the scroll, so I altered crown of four points about the shield to say helm and simple mantling. Make sure your words and the achievement match! Award scrolls almost always start with the assignment. Because I’m running Kingdom Scriptorium, Dame Richenda (that marvelous woman who is handling the assignment list) has given me a list of assignments that are for Kingdom Scriptorium. However, when I was going through the list, I found Alexander Kallidokos’ Award of Arms scroll. I was going to set it up with a template and do the calligraphy and hand it off to someone else to paint, but I noticed his arms are black and white. I’d been looking at a style called grisaille which is mostly monochrome, shades of grey and black, sometimes with one accent color and thought it would be perfect for a scroll with black and white arms. 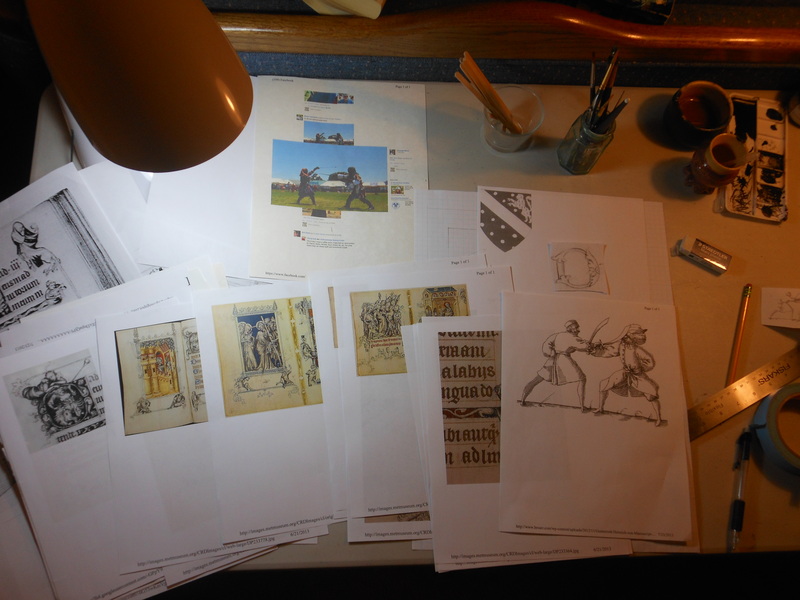 I started looking for examples of grisaille work and found some fabulous examples online and in the book “Manuscript Painting at the Court of France” by Francois Avril which are from the “Hours of Jeanne D’Evreux”. 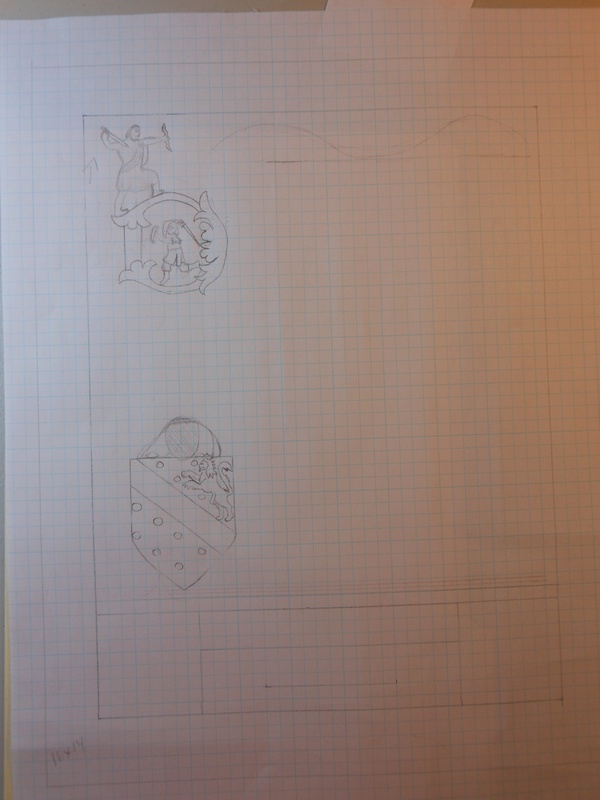 So, I settled on the style I want to do the scroll in. I got a folder and printed out as many examples as I could find online. I asked Master Cormac for a copy of Alexander’s arms and added that to my folder.